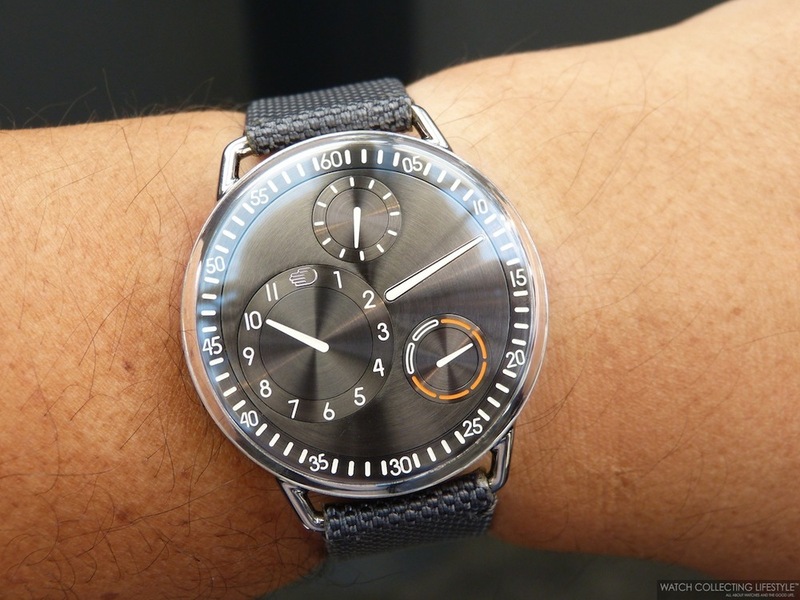 Baselworld 2014: Ressence Type One. Live Pictures and Pricing of Five Amazing Timepieces. After a very successful launch of the Ressence Type 3 —a marvelous watch that won the 'Horological Revelation Prize' at the Grand Prix d'Horlogerie de Genève last year—, the company behind the 'no hands, no crown' watch strikes again at Baselworld 2014. This time, Ressence unveils the new Type One available in five different dials and finishes ready to please the most demanding watchlifestylers. The Type 1B —black— has a matte black dial with white indicators; the Type 1W —white— has a matte white sandblasted silver dial with dark grey indicators; the Type 1G —guilloché— has a silver metallic dial with a classic three dimensional guilloché finish with blued hands and silver surrounds on the indicators; the Type 1R —ruthenium— has a metallic sunray dark grey dial with white indicators and orange surround on the day indicator; and lastly, the Type 1Ch —champagne— has a metallic sandblasted champagne colored dial with rhodium surrounds on the indicators. For those of you not familiar with the Ressence Type 3, we will briefly explain how this watch works. The Ressence Type 3 is literally a watch with 'no-hands and no crown' that transports time from the dial to the crystal. Discs displaying hours, minutes, seconds and days revolve under the domed sapphire crystal, while the date is read from the perimeter of the dial at 6 o’clock. The orbiting indications are bathed in a fluid that refracts light like air, so that the indications appear to be displayed directly onto the sapphire crystal. The mechanism —28 gears and 57 jewels— is enclosed in an upper compartment filled with a naphtha-type liquid that has a more similar index of refraction to the sapphire crystal than air does. 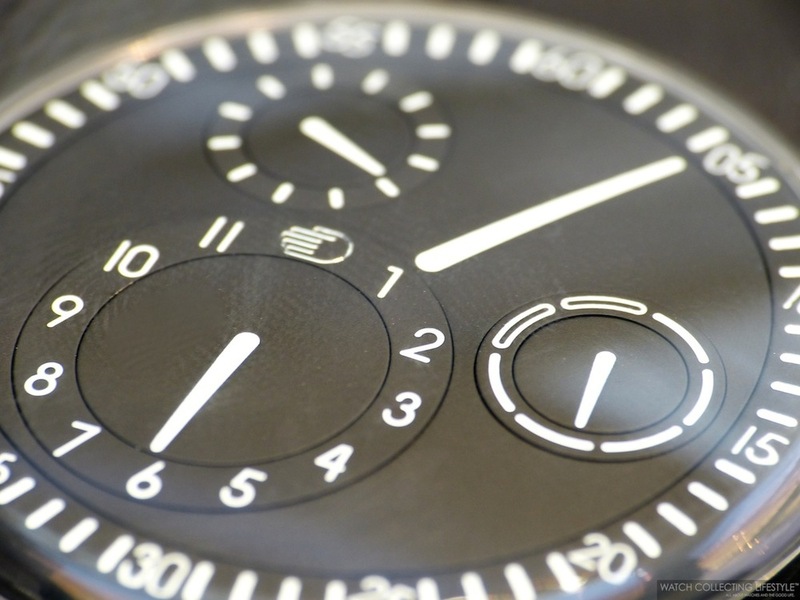 With the fluid-filled dial indications, refraction is greatly minimized, which tricks the brain into seeing the dial in two-dimensions rather than three. A thermal valve automatically adjusts for any expansion or contraction of the fluid. The sapphire case back fulfills the functions of the crown with quadrants on the case back replacing different crown positions. The Type 3 is wound up by turning the case back. To change the date, it is simply necessary to make a longer rotation through 200° in order to arrive at the date quadrant. The hour is set by starting from the neutral position and turning in the direction indicated. 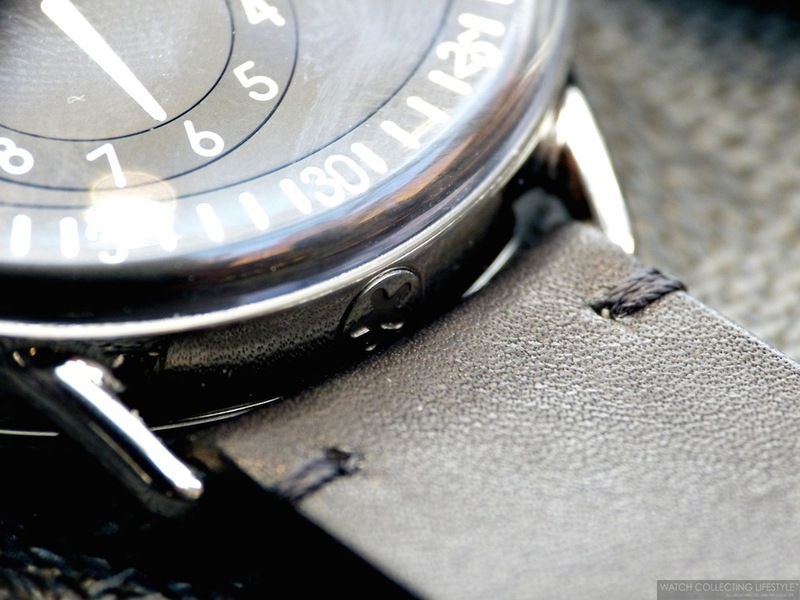 Now, let's start talking about the new Ressence Type One. This new watch is fitted with an ultra light 42 mm case composed of three parts —top and bottom in sapphire crystal and middle case in grade 5 titanium that has been machined from one titanium block— and weighing merely 75 grams. The dial with spherical discs displaying hours, minutes, seconds and days revolve under the domed sapphire crystal. The dial and indications are curved and the engravings on the discs are filled with super-Luminova. The display system has been invented, developed and patented by Ressence and comprises 18 gears and 28 jewels. Just like its predecessor, the Type One has no crown or hands and the sapphire case back fulfills the functions of the crown. The Type One is wound up by turning the case back. Turning the back case in both directions sets the time. Behind the simplified setup/winding system lies the logical principal that one only needs to set the watch when it is stopped. By setting the watch you will wind it. Once set, the automatic winding rotor will take over to complete the winding while wearing the watch. The automatic movement inside the Ressence Type One provides a power reserve of 38 hours when fully wound. The new Ressence Type One accurately provides the hours, minutes, seconds and day of the week on its rotating indicators. The non-overlapping hours, minutes, seconds and day of the week indicators are patented and single surface rotating disks replace the traditional hands. Here's a diagram that shows where each of the different indicators are located on the dial. 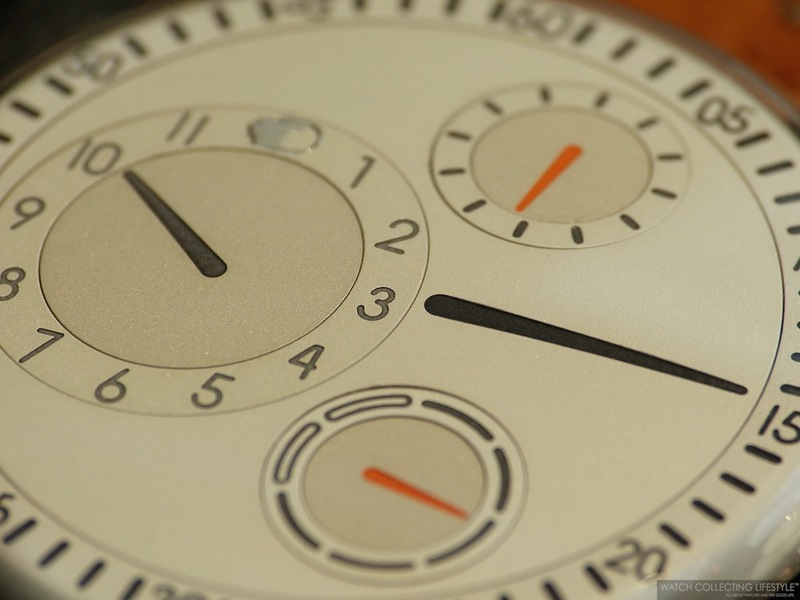 The dials, all very nicely finished look quite minimalist and are well balanced from a design standpoint. Our personal favorite dials are the ruthenium, the guilloché and the white; however, all five different dials are very unique and appealing in their own ways. The straps on the watches compliment the dials perfectly and the craftsmanship behind them is up to par with the craftsmanship of the timepiece. Supple and with rolled edges, these straps are comfortable and elegant at the same time. The attention to detail is prevalent across every component of this new watch and the color combinations are just spectacular. All straps are fitted with deployant buckles that are easy to use and comfortable on the wrist. On the wrist, the watch wears very comfortably and true to its size on a 7.25" wrist. The wrist presence is unparalleled and eye-catching. The captivating way of telling time on this timepiece, is a real treat for the eyes and one great piece of horology that will for sure become a conversation piece wherever you go. Sticker Price $20,000 USD. For more info on Ressence click here. Posted on April 2, 2014 by Editor & Publisher and filed under Baselworld, Ressence and tagged Ressence Type 3 Ressence Type One.